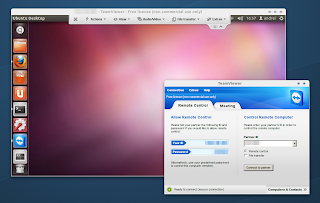 Quick update: the latest TeamViewer 7 for Linux* (application for remote control and desktop sharing) has finally been released today, after being in beta for over a month. The new Linux version brings support for online meetings and presentations with up to 25 participants, a screenshot tool and more. Check out our previous post on TeamViewer 7 beta For Linux. The Windows version (which has been available for about 2 months) release notes can be found here. * Even though TeamViewer is packaged as a .deb or .rpm, it's not a native Linux application and it actually uses Wine (comes bundled with the TeamViewer package).